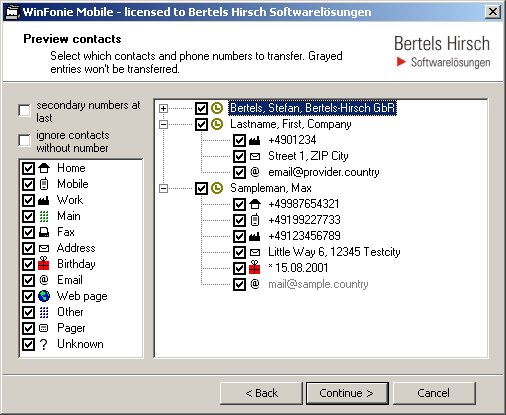 WinFonie Mobile 2 transfers the phone book from Microsoft Outlook, Excel, Access, Palm Desktop, Windows address book, Workpad Desktop, Tobit David, Lotus Notes, Lotus Organizer, Combit Addressmanager or Cobra Adress Plus into your mobile. WinFonie Mobile 2 supports Nokia 6230, 6230i, 6610i, 6310i, 6810, 6822, 7210, 7250i, 6270, 6280, 8800, 5140, 5140i, 6020, 6021 and more. ...... For example you can limit the amount of synchronized address book and calendar entries by filters. You can also set arbitrary name formats for address book entries. WinFonie Mobile 2 supports cell phones from Nokia, Sony Ericsson, HTC, Apple, Motorola and many more. Convert DVD to Mobile Phone and all popular video to Mobile Phone video. Qweas is providing links to WinFonie Mobile 2 2.4.2.35 as a courtesy, and makes no representations regarding WinFonie Mobile 2 or any other applications or any information related thereto. Any questions, complaints or claims regarding this application WinFonie Mobile 2 2.4.2.35 must be directed to the appropriate software vendor. You may click the publisher link of WinFonie Mobile 2 on the top of this page to get more details about the vendor.